The History Of The Golden Retriever is not known to everyone as their origin is new as compared to other breeds. The Golden Retriever originally hails from Scotland and was found in the late 19th century. Golden Retriever is a breed of dog which is of large size. They were named as a ‘retriever’ because they have a unique ability to retrieve shot game undamaged. They are also known for their inborn love of water, and they can be easily trained to basic and extraordinary obedience standards. The breed gains warmth in outdoors place because of their long-coated breed along with a dense inner coat. They also use their outer coat to prevent their body from the water. You can find Golden Retrievers to residency in suburban or country environments. However, a substantial outdoor exercise is must for them. And they should be provided a house in a fenced area because they have a habit of roaming everywhere. They also have a habit of shedding especially when season changes and also they also demand regular grooming. If we look into Golden Retrievers Background we will find that they are classified into three sub types. These types reflect their variations in dimensions and coat. However, you will find all Golden Retrievers in yellow, blonde and gold in color. And they all are prone to similar health problems. UK Kennel Club first registered Golden Retrievers into their club in the year 1903. At that time they were classified as flat coats, yellow or golden in color. They made the first public appearance in the year 1908 and granted separate status after 13 years of 19th century. 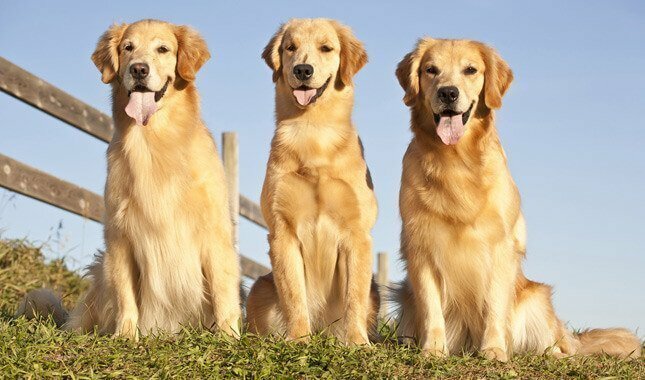 In 1913 the Golden Retriever Club of Great Britain was also formed. In the year 1920 they got recognition by kennel Club and granted name of ‘Golden Retriever’. You can find Golden Retrievers everywhere in Australia and Europe. Forequarters are muscular, balanced muzzle, lighter coat and skull is more fine and bordered in these types of Golden Retrievers. They are well heighted , the Male an grow up to 56 to 61 cm and female can grow up to 51 to 56 cm. There weights are not specified but it is obvious that they will have more than their fellow breed and this is the difference of golden retriever & labrador. The eyes of Golden Retrievers are round and dark and have coat color of shades gold or cream. They love exercise, playing with kids and have awesome adaptability quality. The traces of Golden Retriever was found in America in the year 1880 but people of America was unaware of this breed until UK kennel Club gave them recognition in the year 1920. After 18 years of UK kennel Club. The American planned to start Golden Retriever Club and in the year 1938 the American Golden Retriever Club was established. And quite famous in the united state of america. You will find American type Golden Retriever less muscular and lankier as compare to other types. They are tall than British type. The male Golden Retriever stands between 58 cm to 61 cm and female Golden Retriever stands between 55 cm to 57 cm. The Canadian Kennel Club decided to register Golden Retriever in the year 1927. And a Golden Retriever Club of Ontario was formed to give a new identity to Golden Retriever. Later the Golden Retriever Club of Ontario was renamed as Golden Retriever Club of Canada. The Canadian type Golden Retriever has darker and somewhat thinner coats as compare to other types of retrievers. They are taller than any other type of this breed, the male stands from 23 inch to 24 inch and weight up to 29kg to 34 kg and females stands from 21.5 inch to 22.5 inch and weight up to 27 kg to 32 kg. Read More – Why Golden Retriever are Awesome Pets ? We have gone through the Golden Retriever Information where we take a look at each golden retriever type history and its features. We acknowledged that Golden Retriever is a great pet to have in your house as they will be a permanent friend of your kids. They are also super active and will be your watchman this would help you to protect yours from the unwanted robbery. Golden Retrievers are quite adaptable, so they won’t take a long time to adjust to your home which is a plus point, and this proves Golden Retriever is a great puppy to have in your home.